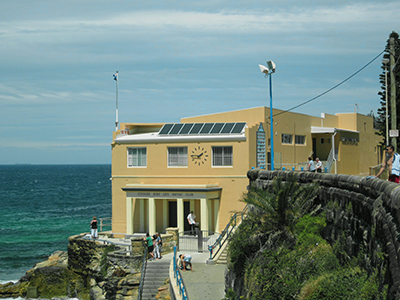 The iconic Coogee Surf Life Saving Club is set for a facelift in 2020 with Randwick Council agreeing at its meeting on Tuesday 26 March 2019 to contribute the remaining $720,000 required for the $3.6M planned revamp. The upgrade will overhaul the façade of the building, provide a new entry way, a new east-facing deck with glass balustrades as well as a reconfigured interior providing more useable space for the surf club and for events and functions. Randwick Mayor Councillor Kathy Neilson said the Council funding meant the project was now fully funded and able to commence construction – anticipated to be winter 2020. “The Coogee Surf Life Saving Club was founded in 1907 and is one of Australia’s oldest surf clubs. The Coogee nippers is one of the largest in Australia providing local kids with positive and healthy activities while building their water safety skills. “The building is a Council asset and it’s appropriate that Council supports the great work of the surf club by allocating funds through the Our Community Our Future program,” Mayor Neilson said. The project is also funded by a $2.58M grant from the Office of Local Government Stronger Communities Fund and a $300,000 grant from the NSW Department of Industry Office of Responsible Gambling. Randwick Council will manage the construction project in close consultation with the Coogee Surf Life Saving Club. Works are proposed to commence in winter 2020 to minimise impact on the club.